It was a great night at the club last night as the Under 6s & 8s teams got together for their presentation evening. There were more than 25 players present with their parents which just goes to show how brilliant this year has been for our youngest age groups in the club. Hopefully this will continue next year and for years to come. All players received a medal and a certificate for all their fantastic work an effort throughout the year. Managers Rory and Kevin were there to congratulate each of them on their great year playing Gaelic Football for St. Colmcilles. All photos from the night can be found in our Gallery. Best of luck today to the St Colmcilles U16s as they compete in the Hertfordshire League Final. They take on St Dympnas at 3pm in Sundon Park. All support would be greatly appreciated as the U16s look to continue a successful year. Colmcilles Abú!! Hopefully there will be similar scenes to last year when the Under 16s won the League in Cotlandswick, St Albans. 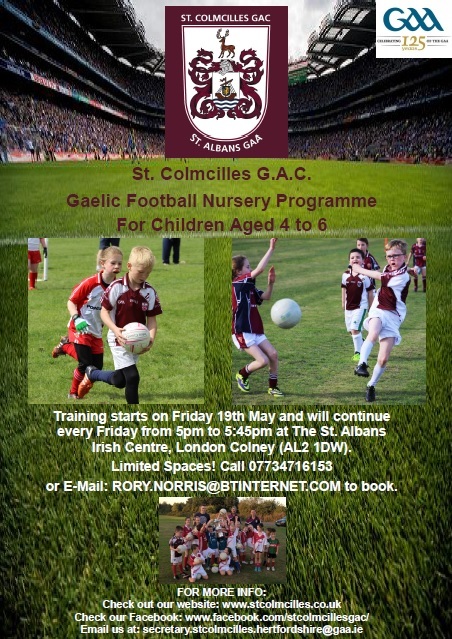 St Colmcilles GAC will be running a new Nursery GAA Programme for boys and girls aged 4-7. This will be a great chance for kids to try something new, develop new skills, make friends and most importantly have fun! 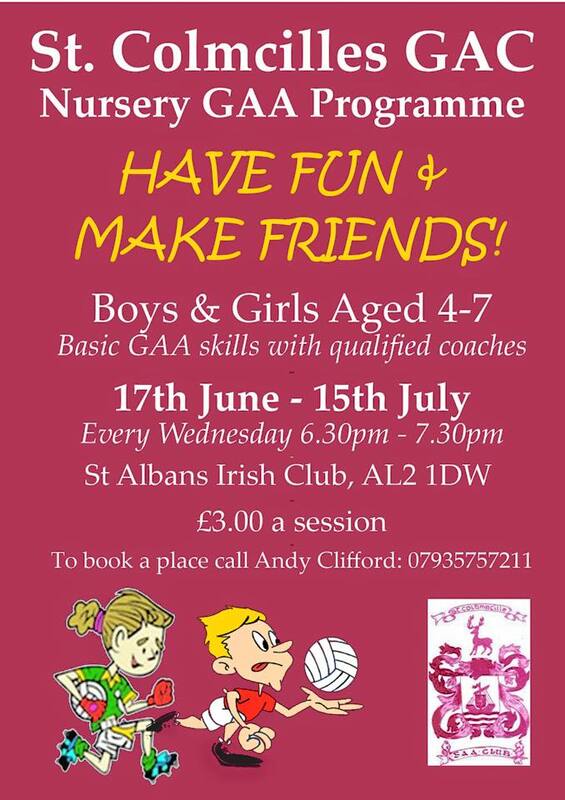 This will be run through June and July, every Wednesday from 6.30pm to 7.30pm in the St Albans Irish Club. All newcomers are welcome to come and join. 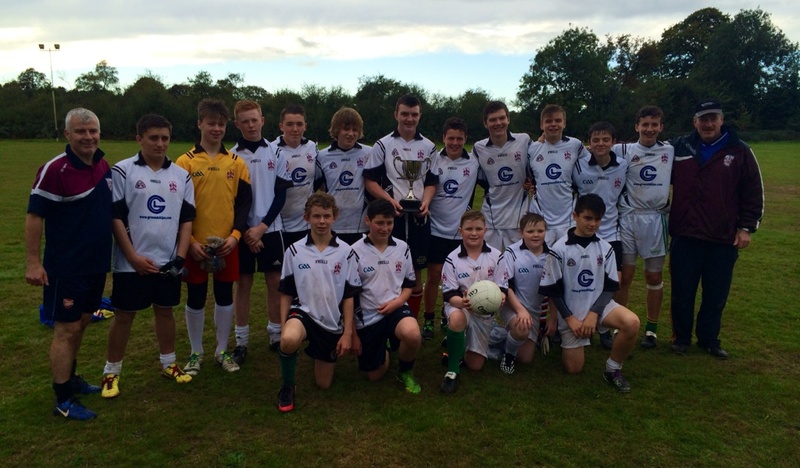 St Colmcilles Under 16 team won the Hertfordshire Championship on Wednesday 27th May in Cotlandswick, St Albans. They beat St Dympnas of Luton by a score of 2-07 to 1-04. A fantastic result from the team as they continue to bring success to the club as most of the team were involved in last year’s League success at Under 16 level. Proud managers, Martin Reynolds and John Ryan are pictured above after the team were presented with their trophy. Team included Ben Aldridge, Fintan Quirke, Jordan Reynolds (Captain), Max August, James Ryan, Owen Griffin, Oliver Pontefract, Sean Walsh, Shane O’Shea, Michael Mullins, Tom Murphy, Michael Mullins, Connor McCallion, Ben McAndrew, Ethan Reynolds, Luke Habberfield, Tom Masterson. 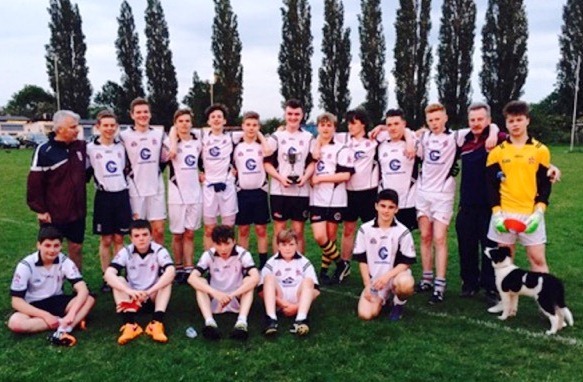 St Colmcilles Under 16 team won the Hertfordshire League on Saturday 4th October in Cotlandswick, St Albans. A fantastic result from the team as they continue to bring success to the club as most of the team were involved in last year’s success at Under 14 level. Proud managers, Martin Reynolds and John Ryan are pictured above after the team were presented with their trophy.